Verdi painted an immense canvas with this dark but tuneful opera, vividly brought to life in John Dexter’s production, with sets by the great Eugene Berman. The legendary Leontyne Price is seen in one of her greatest roles, Leonora. Price’s soaring voice encompasses every nuance of Leonora’s emotion as she moves from joy through resignation to ultimate heartbreak. James Levine’s brilliant leading of the Met orchestra and chorus is a lesson in Verdi style. 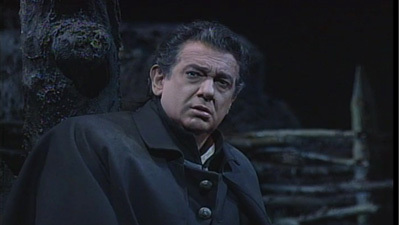 Giuseppe Giacomini is Alvaro, the man Leonora loves, and Leo Nucci is Don Carlo, the dark instrument of their Fate.